Based on videotaped oral histories conducted with Jews living in small-towns throughout Ukraine, this multimedia presentation will take us into the shtetl to hear from Ukrainian Jews about what they remember of the war. 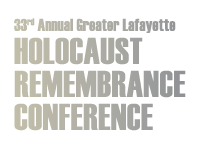 We will discuss the different ways that Ukrainian Jews remember the Holocaust. We will explore the variety of atrocities they experienced and the various modes of survival they employed. The role that the Soviet military victory played in developing popular memory of the war in Ukraine will also be discussed. Jeffrey Veidlinger is the Joseph Brodsky Collegiate Professor of History and Judaic Studies at the University of Michigan. Previously he was Alvin H. Rosenfeld Professor of History and Jewish Studies at Indiana University and Director of the Borns Jewish Studies Program. Professor Veidlinger is the author of The Moscow State Yiddish Theater: Jewish Culture on the Soviet Stage, which won a National Jewish Book Award and the Barnard Hewitt Award for Theater Scholarship, and the author of Jewish Public Culture in the Late Russian Empire, which won a Canadian Jewish Book Award and the J.I. Segal Prize. His most recent book is In the Shadow of the Shtetl: Small-Town Jewish Life in Soviet Ukraine. In 2006, he was named a Top Young Historian by the History News Network. "you can't generalize about Poles... there were Poles whose motive was money and who took large sums for sheltering Jews, there were also people who knew that their job was to rescue, that this was their human obligation." The expression Judenjagd ("Hunt for the Jews") was used to describe the search for Jewish refugees who ran away from the liquidated ghettos and sought shelter among the local "gentile" population. This kind of hunt became one of the most important tasks of the German police forces in occupied Poland. In 1942, following the liquidation of the ghettos, at least 250,000 Polish Jews sought refuge "on the Aryan side." From among them, no more than 30-40,000 survived the war. The fate of the rest remains, for the most part, unknown. The "human horizon" of unknown and unreported victims is, therefore, larger than 200,000 people--and this number pertains to occupied Poland alone. What happened to these people? What were the circumstances of their death? What was the attitude of the local populations to Jews in hiding? These are some of the questions at the core of this lecture. Jan Grabowski Jan Grabowski is Professor of History at the University of Ottawa and a founding member of the Polish Center for Holocaust Research. Grabowski, the son of a Holocaust survivor, a graduate of Warsaw University and received his PhD from the Universite de Montreal. He is author (with Barbara Engelking) of The Contour of a Landscape: Rural Poland and the Extermination of the Jews, 1942-1945 (in Polish).